There were those, of course, whose post-Katrina vision for New Orleans was no New Orleans at all. Or at least not a New Orleans that was going to involve much in the way of national investment. Proponents of this view ranged from former House Speaker Dennis Hastert, who later recanted, to racists and religious fundamentalists eager to see a majority black city with a reputation for moral lassitude punished for its sins. And then there were environmentalists for whom New Orleans’ ruin was a rhetorical convenience in debates about global warming, only more useful so long as that ruin appeared irremediable. Fortunately — or unfortunately, depending on your politics — the native resilience of New Orleans, in combination with the kindness of strangers from all around the world, has trumped the negativists, mainly by ignoring them. New Orleans is not going away, for the time being, anyway. A recovery, of sorts, began within days of the 2005 hurricane and, though still anemic, appears to be gaining vigor. The nostrums recommended for post-Katrina New Orleans — the "new" New Orleans — have been no-brainers. They have been intoned mantra-like by groups small and large ever since the first of the huge post-Katrina congresses in which residents and government officials began plotting a road back: decent schools, better jobs and housing, a first-world flood defense, a more regional approach to economic development, a more equitable medical system, a less corrupt political class. Elaborating on these key themes, the blue-ribbon panels first charged with implementing that vision — the mayor&apos;s Bring New Orleans Back commission, the governor&apos;s Louisiana Recovery Authority, and the months-long experiment in participatory democracy that came up with UNOP (the Unified New Orleans Plan) — gave voice to more idiosyncratic ideas. There would be housing built, as it once was in New Orleans, not on ground-level slabs but in ways that take cognizance of repetitive flooding risks; more parks, retention ponds and green space to absorb rain and floodwater; the clustering of public infrastructure — schools, senior citizen centers, satellite medical clinics, police stations and libraries — to revive neighborhoods and achieve economies of scale; a nurturing of social clubs and organizations (Carnival krewes, for example) close to the heart of the city&apos;s cultural ethos. And the no-nos have been just as widely embraced. In its zeal to remake itself, residents warned, New Orleans must not let gentrification — or worse yet, Disneyfication — destroy the funky indigenous culture of jazz and Creole cooking, second-line parades and Carnival revelry that is a magnet for tourism and a cultural treasure. The federal housing vision, preceding the storm and advocated only more urgently afterward, has been to "Hope VI" New Orleans&apos; sprawling and crime-ridden public housing projects — replace them, that is, with mixed-income communities developed through public-private partnerships. Furious debate slowed that process, given widespread suspicion of the government’s motives, especially at a time when a dearth of low-income housing argued for hastily restoring the projects rather than bulldozing them. But in mid-December, as police subdued an angry crowd of several dozen housing activists and preservationists struggling to disrupt the proceedings, the City Council sided with tenant leaders who favored the overhaul and voted unanimously to demolish four of the biggest projects — provided the feds met certain stipulations for their redevelopment designed to keep former tenants from being lost in the shuffle. Lurking within the many debates — certainly including the one over what to do with the housing projects — has been an issue almost too delicate to mention. Pre-Katrina New Orleans was a city with an indigent population demonstrably larger than it could — or would — support. The causes were complex and interdependent: white flight, decades of continuing disinvestment by the corporate sector, a refusal by taxpayers to significantly upgrade an atrocious school system, and a political class skilled at siphoning revenues from the public purse rather than maintaining critical infrastructure. The results were predictable and chronic: crime; illiteracy; addiction; infant mortality; disintegrating housing projects, water mains and school buildings; an antiquated port; and so forth. Forced removal to other cities — the so-called diaspora — exposed some low-income residents to their first experience of legitimate employability, to schools where their kids actually learned to read. It was possible to share the eye-opening delight of these evacuees while regretting that it might mean their permanent departure from New Orleans. But there was another, more sinister vision inspired by diaspora: the racist vision of a city cleansed of the poor — poor blacks, to be precise. Those subscribing to this vision generally did not mince words, at least in conversations among themselves. Their fantasy, however, did not long remain tenable. In short order, New Orleans had recovered enough of its population to be, once again, the raffish, brawling, ethnically complex place it had always been — spiraling murder rate and all. But two years after Katrina, there is reason to worry that the city&apos;s revival has already hit a plateau that lies far short of the "new" New Orleans envisioned in the early, anxious days just after the floodwaters were pumped out. The urgency of that moment gave birth to high hopes: that Katrina had laid bare long-standing pathologies in New Orleans&apos; political culture that would no longer be tolerated; that the very scope of the disaster would call forth federal and philanthropic largesse on an epic scale (nest-featherers and humanitarians alike rubbed their hands in glee); and that, of course, the failure of the federal levee system would be atoned for with the immediate creation of a state-of-the-art flood defense worthy of a great city in a first-world country. Some of these assumptions have been borne out. In hindsight, though, the most important of them was sadly naïve. As the rest of the city&apos;s recovery progressed in fits and starts, the federal government approved — and New Orleanians have so far accepted — a patchwork approach to levee repair that leaves the city one storm from annihilation and clouds any hope for a full renaissance. • Consolidation of old political sinecures and the requirement that future officeholders know at least as much about their respective areas of operation — tax assessment, levee management and court management, for example — as about the patronage and cronyism that were the principal focus under the ancien régime. • The state&apos;s successful acquisition from the feds of a share of offshore oil and gas royalties, an annual revenue stream that will grow considerably in the future but that even now is enough to leverage financing to halt erosion and restore coastal marshes, a critical buffer between New Orleans and onrushing hurricanes. • An extraordinary string of successful prosecutions of corrupt politicians by the U.S. Attorney in New Orleans, Jim Letten — amounting to a real turning point in a city that long regarded dirty pols as an inevitability, even an amusement. Not to be outdone, the City Council named an inspector general to fight corruption in City Hall and then defied a mayoral maneuver that would have underfunded the office. • The state takeover of the Orleans public school system (not without howls of dismay from the teachers&apos; union and a largely sidelined school board), making for the nation&apos;s largest experiment in charter schools as a way to force educational reform. • A decision by the Department of Veterans Affairs and state officials to join forces and achieve economies of scale in rebuilding Charity, the city&apos;s public hospital, and the treatment facility for wounded and aging veterans that was also destroyed in the storm. Among post-Katrina political accomplishments, another stands out at the state level: the election of a most improbable governor. Inaugurated in January, Bobby Jindal is a whiz-kid conservative technocrat, an immigrant couple&apos;s son with an Ivy League pigskin on his office wall and a Rhodes scholar line on the résumé. The first governor in U.S. history who traces his ethnic heritage to India, he is also the first Louisiana governor of color since Reconstruction. More to the point, as aggressive reformers go, Jindal is from all appearances the real thing. Unfortunately, government also has had to account for some of Louisiana&apos;s biggest disappointments, starting with the root of all misery, the collapse of the federal levee system, and continuing with lethally stupid blunders by the Federal Emergency Management Agency and the White House in the storm&apos;s immediate aftermath. Fecklessness in New Orleans City Hall has done its part to weaken the recovery, as has the infuriating clumsiness of the Road Home bureaucracy set up by a private firm under contract to the state to distribute federal guilt money to residents whose homes were damaged or destroyed by levee failure. Government’s shortcomings have been offset by the work of nonprofits and informal community associations, the second leg of the three-legged stool that is the American way of getting stuff done. Habitat for Humanity plunged into the breach and has been fast at work ever since Katrina on a whole village of new houses that people of minimal means — musicians especially — can acquire through sweat-equity. With greater razzle-dazzle, in December the movie actor Brad Pitt rolled out his vision for affordable, environmentally enlightened housing. After investing $3 million in a French Quarter mansion, Pitt threw $5 million on the table and challenged other millionaires and philanthropists to match him. His vision: scores if not hundreds of environmentally "green" houses for displaced residents of the flood-ravaged and now weed-choked Lower Ninth Ward. His Make It Right Foundation juried a competition among worldwide architects to come up with 14 cutting-edge designs — some of them even float — that qualified residents can choose among. Whether Pitt&apos;s vision catches on — whether, indeed, it is wise to throw resources into a place as vulnerable as the low-lying neighborhood he has chosen to rehabilitate — remains to be seen. But his presence in New Orleans fulfills the hope of a well-heeled cadre of New Orleanians who saw the challenges that recovery entailed as a whetstone on which the city could refine its political instincts and its international reputation for music, art and design. Early plans for a major jazz museum and performance space have been dealt a setback by the retreat of the developer who thought he had coaxed support from the city — which then dropped the ball. But next fall New Orleans will debut an omnibus arts festival that is being compared, in its infancy, to the Venice Biennale. Moreover, the Legislature has developed a package of tax incentives that may make New Orleans, today one of the busiest movie-making locations in America, an equally attractive environment for the production of legitimate theater. But the heart and soul of New Orleans&apos; reawakening has been cheerfully unofficial, even anarchic. Faith-based and secular, well-heeled and rough-hewn, volunteers have flooded the city to gut houses, revive neighborhoods, heal the sick and feed the homeless. A cadre of more lasting visitors — filmmakers, freeloaders, teachers, architects, community organizers, entrepreneurs, musicians, idlers and opportunists — has also drifted into the city, taken a look around and, like Pitt, decided to stay, providing a small counterweight to the large number of professional people who bailed out after Katrina. 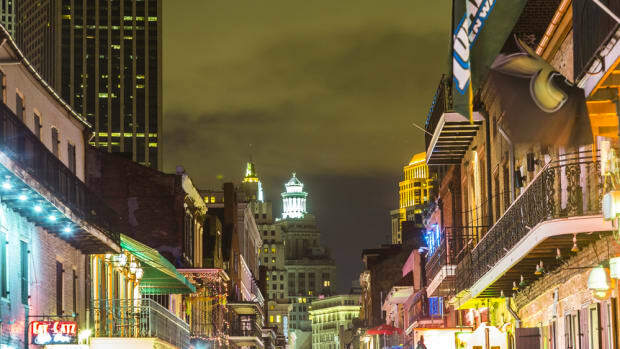 The newcomers have given New Orleans some of the cachet of New York in the 1950s or San Francisco in the 1960s. Or maybe Prague after the Soviet pullout is the better analogy — a city of all-night rap sessions and sky-blue dreams of transformation. New Orleans, in a sense, has become a laboratory for its own reinvention. The universities — Tulane, Xavier, Dillard, University of New Orleans, Southern University at New Orleans, Holy Cross — have been a linchpin in this process, feeding manpower and other resources into the volunteer efforts, and some of them reorienting curricula to make exposure to the post-Katrina challenges a learning-as-you-serve experience. Virtually every economic analysis and recovery agenda has recognized the university-linked biotech field as a potential growth sector in an economy that needs to expand beyond tourism, the port and what’s left of the oil and gas industry. LSU&apos;s decisions to keep its medical school in New Orleans and to rebuild Charity, the city&apos;s public hospital, in tandem with the VA are seen as a platform on which biotech will stand. Which brings us to the bad news. Unlike the government and nonprofits, the third leg of the three-legged stool that is the American economy, the for-profit sector, has turned out to be rather wobbly in New Orleans. And this is particularly concerning, given the great faith placed in it as recovery’s mainstay. Because Katrina struck in the age (or at least at the tag end) of neo-conservative ascendancy, the approved strategies for revival were bound to be heavily market-conscious, not just in Washington and Baton Rouge but, less predictably, in New Orleans itself. That would be so even if the White House were not floating in its own flood of red ink as a result of Iraq. It would be so even if Louisiana&apos;s roguish political culture did not inspire deep skepticism that federal dollars were going to be misapplied or stolen outright. It became especially so when Mayor Ray Nagin, facing re-election in early 2006, turned his back on the tough-love prescriptions for recovery recommended by Bring New Orleans Back consultants: retrenchment from the hardest hit areas and a phased-in recovery that would have focused limited public resources on less damaged areas. Instead, Nagin — who had never run for office when he stepped out of the ranks of corporate middle management to become mayor — adopted a laissez-faire approach and began loudly and frequently endorsing market forces as the key to recovery. Rather than declare a recommended moratorium on rebuilding until recovery strategies could be plotted, he handed out rebuilding permits as though they were campaign flyers, which in a sense they were. In some parts of New Orleans, the results today are fulfillment of the consultants&apos; most dystopian vision: lonely sentinels of recovery in a sea of blight, a city sprawling out to its farthest pre-storm extremities but without the tax base sufficient to maintain the infrastructure of schools and policing and firefighting, streets and sewers that, even before Katrina, was languishing. This federal and local deference to markets — sometimes decried as mere camouflage for indifference or incompetence — has become the shaping force in the post-K vision, in which creative entrepreneurs and well-oiled capital markets pour resources into New Orleans and, more effectively than any government agency, not only revive a city these same forces had largely ignored for decades but transform and improve it. Just in case markets needed reminding that they were freedom&apos;s bulwark, the White House heaped the table high with billions in tax breaks, accelerated depreciation schedules and other goodies to draw investors to what is being called the Gulf Opportunity Zone. Alas, the early GO Zone returns were discouraging. In a first major accounting last spring, less than 1 percent of the billions made available as an incentive for private investment went for projects actually based in New Orleans. This happenstance came as no surprise to Ed Blakely, the urban planner hired belatedly at the end of 2006 as the city&apos;s recovery czar. Having recently added housing, economic development and code enforcement to his portfolio, he is arguably the most powerful man in New Orleans government. "The for-profits left here a long time ago," says Blakely, who clinched a reputation for sometimes breathtaking candor with his announcement, early in his tenure, that the New Orleans political class was composed of a bunch of "buffoons," a designation from which he did not seem to exempt his employer, the mayor. But what to do? How to coax a more vigorous performance from corporate and entrepreneurial America? All parties to serious discussion about New Orleans — certainly including Blakely, who sidelines as a real estate developer, with a major stake in a thousand-acre play in Southern California — accept that government and philanthropy can&apos;t do the job unaided. Jindal’s strategy for reawakening business interest in the disaster zone is, at least initially, unilateral. As might be expected of a conservative who, though Catholic, campaigned on a family-values platform, he took office vowing that his first act as governor would be to call the Legislature into session on a one-item agenda: reforming the state&apos;s ethics code. Christian virtue aside, a tougher ethics code would help Louisiana overcome its reputation — recently reinforced by the indictment of Congressman "Dollar" Bill Jefferson on bribery charges — as a place where you can&apos;t do business without cutting sticky-fingered politicians in on the deal. Blakely supports ethics reform, though he is less convinced that its role will be pivotal. After all, he notes, plenty of other markets are rife with corruption. And in other respects as well, Blakely&apos;s strategy for New Orleans’ recovery bespeaks this more sophisticated — some might say cynical — view of reality. Blakely is a patient man, more patient certainly than the many residents who already scold him for the slow pace of recovery. The scope of the disaster in New Orleans — comparable to another catastrophe Blakely has studied closely, the devastation of Kobe, Japan, following the 1995 earthquake in that Japanese port city — suggests a similarly protracted arc for recovery: 10 years at minimum, he speculates, perhaps as long as 20. Blakely&apos;s hopes for New Orleans&apos; eventual revival are vested in public/private partnerships. His opening salvo upon arrival was to comb through the endless and sometimes contradictory wish lists developed by the Unified New Orleans Plan process and identify what he called "target zones" — 17 of them. Scattered across the city, but concentrated in the older, generally dryer areas west of the Industrial Canal, the zones were targeted for allocation of incentives and direct government investment in infrastructure to entice the for-profits back to the table. Blakely&apos;s further hopes for the economy hinge on refocusing the mission of another of the city&apos;s most important assets: the Port of New Orleans. In Blakely&apos;s view, the proper strategy at a time when New Orleans can no longer ignore rivals such as Houston/Galveston, Miami or even Mobile, Ala., is for the city to accept a niche role, realizing that vast break-bulk cargoes (excepting crude oil and coffee) will pass through untouched by local efforts to add value. Instead, New Orleans is positioned as a staging area for breaking down manufactured cargoes — above all from China — into smaller loads that can be shipped across the continent by truck or train. And on the way back to Asia via Latin America, the freighters, now too often empty, can be at least partially laded at New Orleans with American manufactures: furniture from the Carolinas, carpeting from Georgia and the like. Still, an elephant remains in the room, and he&apos;s a weirdly quiet beast these days: flood defense. Just after Katrina, when the federal government demanded that Louisiana overcome fractiousness and, in White House liaison Don Powell&apos;s words, "speak with one voice," one item topped every agenda: the need for the finest flood defense money could buy, levees and additional floodgates that would stand up even to Category 5 storms. Instead, with much fanfare, around the second anniversary of the storm, the federal government rolled out its commitment to the city: a so-called 100-year flood defense, an unfunded patchwork approach that, even if completed in several years, would not necessarily withstand Katrina — a 300-year storm, according to the experts — let alone the truly horrific storms that the Gulf can whip up. Scholars of mass psychology could have a field day with the flood-defense phenomenon. Has the ordeal of protracted recovery given a once high-stepping city a diminished sense of self-esteem and entitlement? Have the gates knocked together at the end of two canals that collapsed had a placebo effect that leaves the city feeling immunized against other points of vulnerability? Whatever the cause, the result can be likened to a process of self-hypnosis: Maybe if New Orleanians don’t acknowledge the flooding problem, the for-profit sector won&apos;t either. The Rand Corporation remains unhypnotized. In a report to the City Council, Rand listed uncertainty about the levees as a principal retardant of corporate reinvestment in New Orleans. Blakely, for the record, does not accept the Rand analysis without qualification; the Californian in him has a different perspective. After all, despite an ever-present threat of earthquakes, the Golden State has been able to remain a lodestone for investment, he points out. But there&apos;s an undeniable inconsistency to the analogy: Earthquakes can&apos;t be averted, but flooding can be all but entirely eliminated. Can be, but hasn’t been. The can-do impulse that once defined the American approach to engineering challenges — the one that dug the Panama Canal and put men on the moon — is suddenly in check when it comes to New Orleans&apos; flood defense. And the feckless flood-protection response from both the White House and Congress has had the effect of reinforcing a message that the city has long struggled against, a message surely not lost on corporate boardrooms: A majority black, traditionally Democratic city has been deprioritized by the current administration, written out of the national agenda. And yet, like the river that runs through it, New Orleans keeps rolling along, lucky for the two eerily serene hurricane seasons that followed Katrina. And since the hurricane, New Orleans has repeatedly defied prognostication, sometimes in positive ways, sometimes in negative ones. 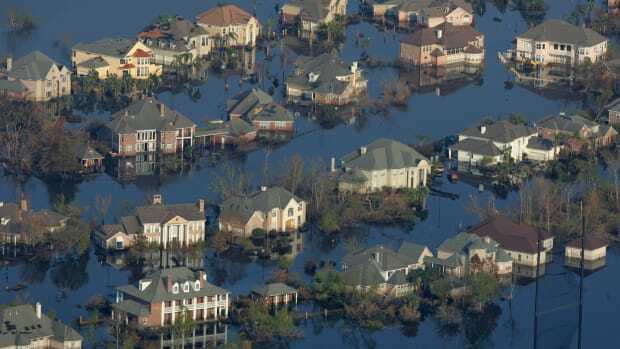 A truly reassuring federal recommitment to flood defense might not be the silver bullet that slays the corporate world&apos;s reluctance to muddy its feet in New Orleans. But it sure seems worth a try. And that would be so even if Washington owed New Orleans nothing for the lives lost, and the hundreds of thousands of houses destroyed, when the levee system collapsed, and the federal government fiddled while much of New Orleans drowned. Jed Horne is a Pulitzer Prize-winning journalist who was for many years city editor of the Times-Picayune, the New Orleans daily newspaper. He is the author of two books: Breach of Faith and Desire Street: A True Story of Death and Deliverance in New Orleans.